We're walking across Rannock Moor from Corrour Station to Glen Nevis, and from there on the Fort William. We're almost at the end of the part across the high moors and mountain valley, once past Steall and the An Steall Bàn waterfall we'll descend into Glen Nevis on a much more organized path, and then follow a road to Fort William. The settlement of Steall was where Allt Coire Ghiuthsachan flowed down from a high valley between Aonach Beag and Ben Nevis. 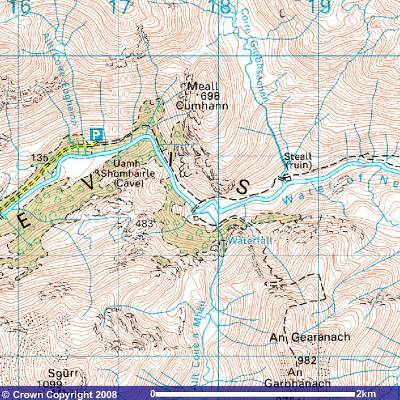 Today Steall is just a collection of low foundations of a dozen or so structures around NN 186 687. About a kilometer beyond Steall you pass the famous three-wire bridge across the Water of Nevis, leading to An Steall lodge and the waterfall An Steall Bàn. The path turns about ninety degrees to the right to enter the upper end of the dramatic gorge Eas an Tuill, between the high Cathar na Seilge on your left and the even higher Meall Cumhann on your right. 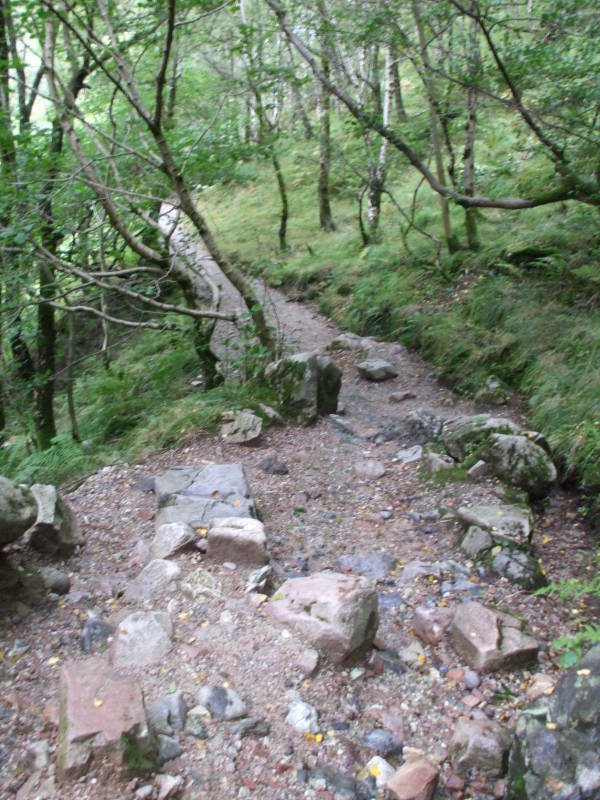 The path is cut into the steep slope, and winds around to the car park at the end of the Glen Nevis road. Here are the remains of a building from Steall, with Allt Coire Ghiuthsachan coming down from the mountains behind it. 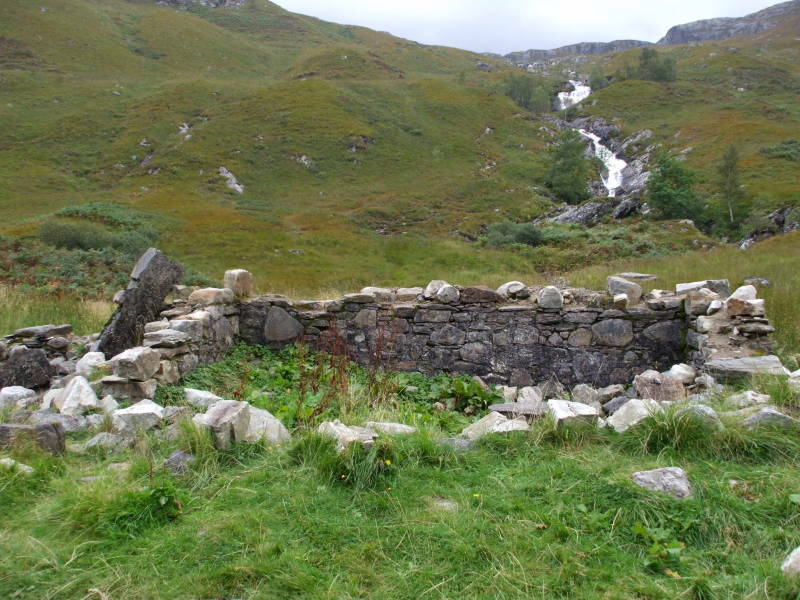 The ruins of the pre-Clearance settlement of Steall. An Steall Bàn, a waterfall with a 120 meter sheer drop. Like so many things in the Highlands, An Steall Bàn is even bigger than it looks because it is surrounded by large mountains. It has a sheer drop of 120 meters. It is formed by the stream Allt Coire a' Mhàil coming down from the Mamores. 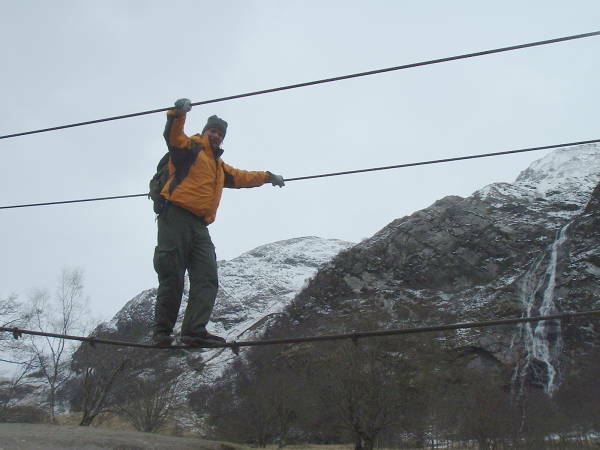 Crossing the three-wire bridge over the Water of Nevis to the An Steall Bàn waterfall on an earlier trip. Here I am continuing past An Steall Bàn. 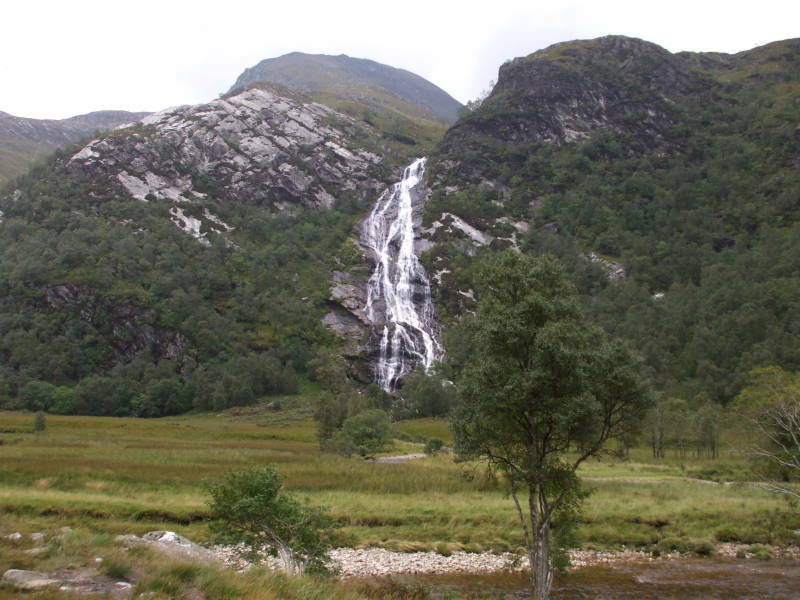 My page about Glen Nevis has some pictures of the waterfall and the three-wire bridge at NN 177 684. Continuing past the waterfall to the gorge down into Glen Nevis. Entering the gorge into Glen Nevis. I passed An Steall Bàn about 1600. 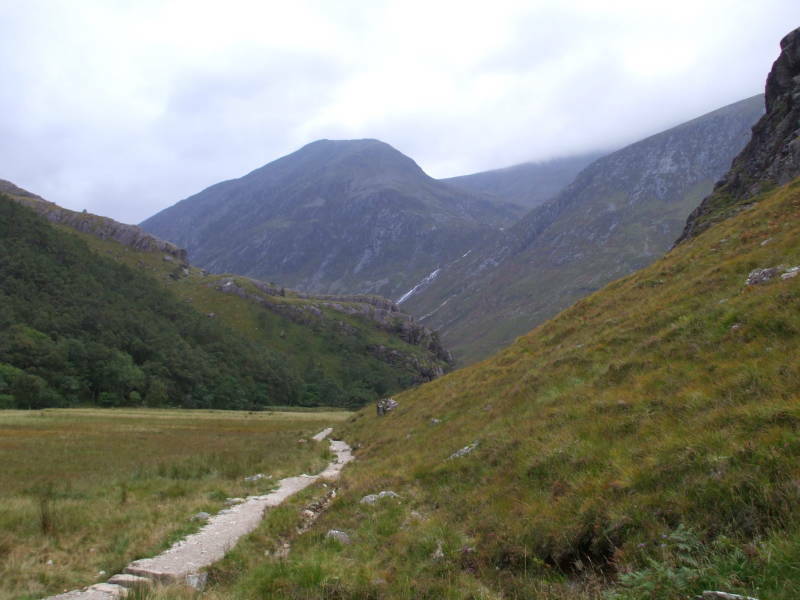 The valley and the path curve slightly to the right, then descend the steep gorge while turning ninety degrees to the left, in front of those large slopes you see coming down from outer subsidiary peaks of Ben Nevis, whose summit is hidden by clouds. Here is the entrance to the sudden drop into the gorge of Eas an Tuill. The Water of Nevis tumbles down a series of falls with about a 100 meter drop over the course of one kilometer. The peaks visible ahead and to the right are some outlying subsidiary peaks on the north slopes of Ben Nevis. 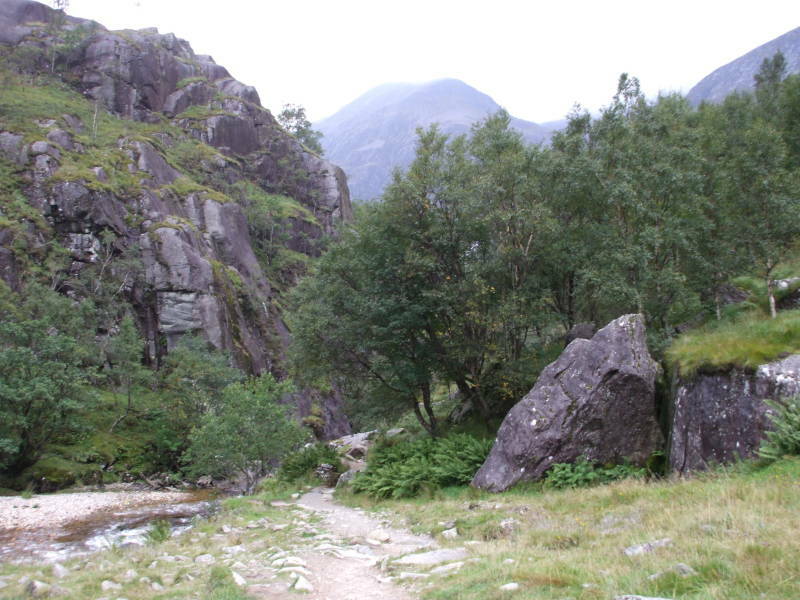 The path down the gorge into Glen Nevis. There is a sudden change not only in topography but also in vegetation and, it seems, microclimate. The gorge is pretty lush with vegetation because of all the extra moisture kicked into the air by that series of waterfalls. As though things weren't already quite moist! The Lonely Planet books Walking in Scotland and Walking in Britain describe this gorge, perhaps a little oddly, as "mini-Himalyan in character".